Once, in the middle of a dance floor at some annual ball, a young lady had a sudden glimpse of the immortality of her soul, and as this vision flashed upon her inward eye, she was struck with the thought that all this swirling around the dance floor was utterly futile. Amazed and disturbed, she wrote to the recluse: “Is this normal, or is it a morbib hindrance to a desire for a happy life in the world?” The answer to her question evoked a correspondence which resulted in this volume. 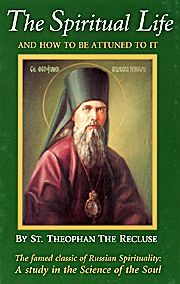 St. Theophan strove to make sure that the young soul of his correspondent would not only be familiar with the principles of spiritual life, but would first of all be able to keenly hear the right “tone” of spiritual life. He attuned her soul to that tone, like an instrument to a pitch, in a way natural to her personality. He helped her first of all hear the movement of her spirit, and only then, using the instrument of her soul, did he help her to hearken to the Spirit of God which “bloweth where it listeth” (John 3:8). This tuning of the soul is necessary so that the soul will be in harmony with the voice of God’s Providence echoing in the instrument of the heart. Therefore, this book can be rightly called a primer to be used before embarking into the realm of spiritual life. Softbound. 316 pp.